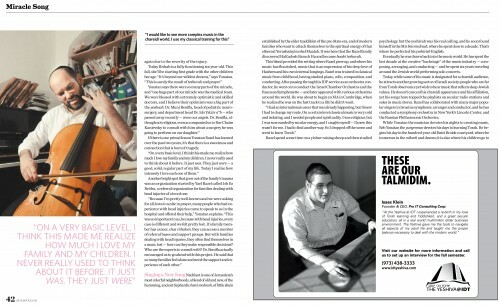 While a collection of giggling children playfully scamper up one of the winding stone staircases in Jerusalem’s picturesque Nachlaot neighborhood, singer-composer Yonatan Razel watches with unchecked emotion. One of those little girls is his oldest daughter, six-year-old Rivkah, whose laughter blends in with the excited chatter of the group. Yet for him and the rest of the family, it’s no laughing matter. Rivkah’s movements are nothing short of a medical miracle. In 2010, when Razel was still riding a wave of success in the chareidi music world with his song “Vehi She’amdah,” Rivkah had a horrifying accident that left her fighting for her life. Now that the Razels have emerged from the nightmare, Yonatan shares his thoughts on what could loosely be termed a medical miracle, and on the tremendous revelation of Divine loving-kindness in the face of tragedy. 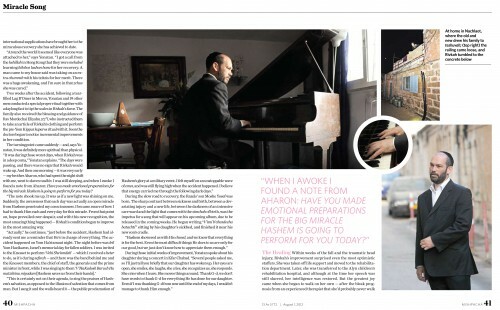 We Never Left Her Side Two years ago — what seems to him like a lifetime — Yonatan Razel’s world turned upside down following the triumph of his first album, Sach HaKol in 2007 and the success of his hit song “Vehi She’amdah” — which he composed, produced, and arranged, and then performed with Yaakov Shwekey. He was named “Singer of the Year” by Ynet and his “Vehi She’amdah” was awarded “Song of the Decade” by the Israeli station Radio Kol Chai, and he was back in the recording studio, working on a new album. But that came to a screeching halt the night his oldest child, four-year-old Rivkah, went out onto the porch of the family’s second-floor home in Jerusalem’s Nachlaot neighborhood to watch the Israel Independence Day fireworks display. As she leaned on the railing, it suddenly gave way and she went tumbling onto the concrete below. A short distance away, a young man who happened to be a Hatzolah paramedic was waiting for his brother, who was late. The young man lost patience and decided to leave, cutting through the parking area under the Razel home. Just then, Rivkah fell, and seconds later the paramedic was there with his rescue equipment trying to resuscitate the child. Rivkah was rushed, unconscious, to Hadassah Ein Kerem’s trauma unit. Her prognosis looked bleak. The Razel (formerly Rosler) family is somewhat of a clan in Nachlaot. Professors Michah and Carol Razel moved to the neighborhood close to four decades ago from New York when Yonatan was a year old — a move that eventually pushed the family to embrace a Torah lifestyle. Yonatan and his two brothers, singer-songwriter Aharon and Yehudah, and sister Ricka (Van Leeuwen) all still live within two blocks of their parents and each other. During the weeks when Rivkah’s situation was critical, the entire family banded together in shifts so that Yonatan and his wife Yael were never without family support at her bedside. The name “Rivkah bas Yael” was added to Tehillim and prayer lists around the world; tens of thousands of Jews mentioned her name in supplication. As the weeks passed, Yael Razel said at the time that her greatest fear was that people would begin to forget about her daughter. She and Yonatan knew that the prayers were keeping her alive, and are convinced that those international supplications have brought her to the miraculous recovery she has achieved to date. Two weeks after the accident, following a tear-filled Lag B’Omer in Meron, Yonatan and 19 other men conducted a special prayer ritual together with a daylong fast to tip the scales in Rivkah’s favor. The family also received the blessing and guidance of Rav Mordechai Eliyahu ztz”l, who instructed them to take an article of Rivkah’s clothing and perform the pre-Yom Kippur kaparos ritual with it. Soon the doctors began to notice incremental improvements in her condition. The turning point came suddenly — and, says Yonatan, it was definitely more spiritual than physical. “It was during those worst days, when Rivkah was in a deep coma,” Yonatan explains. “The days were passing, and there was no sign that Rivkah would wake up. And then one morning — it was very early — my brother Aharon, who had spent the night shift with me, went to daven vasikin. I was still sleeping, and when I awoke I found a note from Aharon: Have you made emotional preparations for the big miracle Hashem is going to perform for you today? “The note shook me up. It was as if a new light was shining on me. Suddenly, the awareness that each day was actually an open miracle from Hashem penetrated my consciousness. I became aware of how I had to thank Him each and every day for this miracle. From that point on, hope prevailed over despair, and with this new recognition, the most amazing thing happened — Rivkah’s condition began to improve in the most amazing way. During the slow road to recovery, the Razels’ son Moshe Yosef was born. 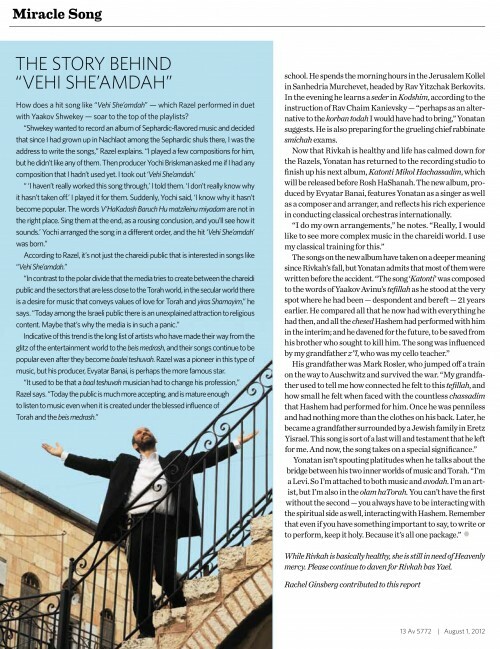 The sharp contrast between sickness and birth, between a devastating injury and a new life, between the darkness of an intensive care ward and the light that comes with the simchah of birth, was the impetus for a song that will appear on his upcoming album, due to be released in the coming weeks. He began writing “V’ani b’chasdecha batachti” sitting by his daughter’s sickbed, and finished it near his new son’s cradle. The Healing Within weeks of the fall and the traumatic head injury, Rivkah’s improvement surprised even the most optimistic staffers. She was taken off life support and moved to the rehabilitation department. Later, she was transferred to the Alyn children’s rehabilitation hospital, and although at the time her speech was still slurred, her intelligence was restored. But the greatest joy came when she began to walk on her own — after the bleak prognosis from an experienced therapist that she’d probably never walk again due to the severity of the injury. 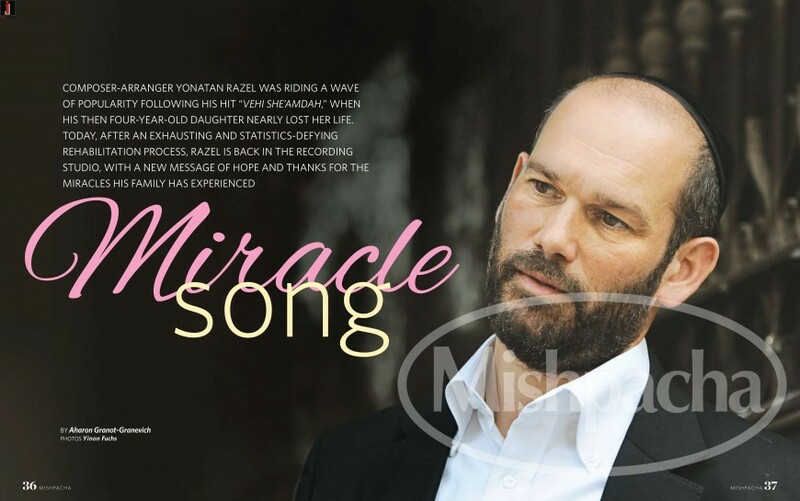 If there is one primal lesson Yonatan Razel has learned over the past two years, it’s that there is a sweetness and connection that is born of tragedy. Another bright spot that grew out of the family’s trauma was an organization started by Yael Razel called Ish Es Re’ehu, a referral organization for families dealing with head injuries of a loved one. Singing a New Song Nachlaot is one of Jerusalem’s most colorful neighborhoods, a blend of old and new, of the humming, ancient Sephardic batei medrash, of little shuls established by the elder tzaddikim of the pre-State era, and of modern families who want to attach themselves to the spiritual energy of that ethereal Yerushalayim shel Maalah. It was here that the Razel family discovered HaKadosh Baruch Hu and became baalei teshuvah. This blend provided the setting where Razel grew up, and where his music has flourished, music that is an expression of his deep love of Hashem and his own internal longings. Razel was trained in classical music from childhood, having studied piano, cello, composition, and conducting. After passing through his IDF service as an orchestra conductor, he went on to conduct the Israel Chamber Orchestra and the Raanana Symphonette — and later appeared with various orchestras around the world. He was about to begin an MA in Cambridge, when he realized he was on the fast track to a life he didn’t want. Razel spend some time on a yishuv raising sheep and then studied psychology, but the yeshivah was his real calling, and he soon found himself in the Mir beis medrash, where he spent close to a decade. That’s where he perfected his yeshivish English. Eventually he was drawn back into the music world. He has spent the last decade at the creative “backstage” of the music industry — composing, arranging, and conducting — and he spent six years traveling around the Jewish world performing solo concerts. Today, while some of his music is designated for a chareidi audience, he attracts another growing sector of Israeli society: people who are far from Torah observance yet wish to hear music that reflects deep Jewish values. 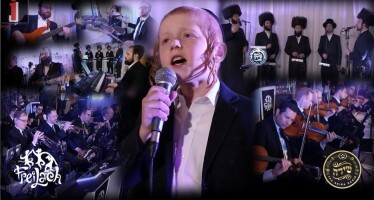 He doesn’t conceal his chareidi appearance and his affiliation, yet his songs have topped the playlists on secular radio stations and sales in music stores. 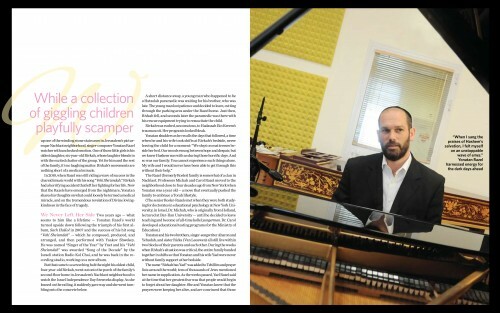 Razel has collaborated with many major popular singers in Israel as symphonic arranger and conductor, and he has conducted a symphony orchestra in New York’s Lincoln Center, and the Russian Philharmonic Orchestra. While Yonatan the musician devotes his nights to creating music, Reb Yonatan the yungerman devotes his days to learning Torah. He begins his day in the hundred-year-old Batei Broide courtyard, where he immerses in the mikveh and davens; it is also where his children go to school. He spends the morning hours in the Jerusalem Kollel in Sanhedria Murchevet, headed by Rav Yitzchak Berkovits. In the evening he learns a seder in Kodshim, according to the instruction of Rav Chaim Kanievsky — “perhaps as an alternative to the korban todah I would have had to bring,” Yonatan suggests. He is also preparing for the grueling chief rabbinate smichah exams. Now that Rivkah is healthy and life has calmed down for the Razels, Yonatan has returned to the recording studio to finish up his next album, Katonti Mikol Hachassadim, which will be released before Rosh HaShanah. The new album, produced by Evyatar Banai, features Yonatan as a singer as well as a composer and arranger, and reflects his rich experience in conducting classical orchestras internationally. While Rivkah is basically healthy, she is still in need of Heavenly mercy. Please continue to daven for Rivkah bas Yael. How does a hit song like “Vehi She’amdah” — which Razel performed in duet with Yaakov Shwekey — soar to the top of the playlists? Indicative of this trend is the long list of artists who have made their way from the glitz of the entertainment world to the beis medrash, and their songs continue to be popular even after they become baalei teshuvah. 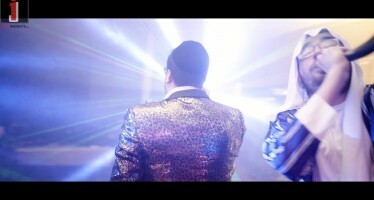 Razel was a pioneer in this type of music, but his producer, Evyatar Banai, is perhaps the more famous star.